While divorce is a difficult process, there are many cases where the parties actually work together to come to an agreement on the significant issues that must be resolved, such as child support, division of property, and spousal support. By agreeing and stipulating to certain terms, the couple can avoid having a judge devise an order that will affect their family going forward. If the parties are able to come to an agreement, a court will simply need to approve the agreed-upon terms. In order to ensure that your negotiations appropriately address the necessary topics, while protecting your rights, it is important to consult with an experienced family law attorney who is fully familiar with the laws affecting families in and around the San Diego area. In a recent California divorce case, In re Marriage of Roberta Sala-Clow and Tracy Clow, the wife attempted to avoid complying with an agreed-upon stipulation after her husband died in a car accident. Here, the couple married in 1991 and in January 2010, the wife filed an action to dissolve the marriage. On June 1, 2012, the parties signed a handwritten stipulation purporting to resolve support and property matters. The document contained a statement indicating that the parties had both read and understood the stipulation and agreement. The couple requested that the court integrate the stipulation and agreement into the court’s order. Sadly, the husband died in a car accident on June 6, 2012. On June 8, 2012, the court filed the stipulation and order for judgment that was signed by the parties and their attorneys. The husband’s attorney asked the court to sign and enter a stipulated judgment pursuant to the agreement the parties executed on June 1, 2012, and to issue an order terminating the parties’ marital status as of June 1. According to the court, the wife opposed the motion and tried to “undo” the stipulated judgment by claiming her husband’s death terminated the marriage by operation of law, thereby stripping the family court of any jurisdiction over the case. The trial court concluded that it would be a “miscarriage of justice” if it did not enter the judgment and therefore granted the motion to enter judgment in accordance with the handwritten stipulation as of June 1. The court pointed out that under California Family Code Section 2346, it had the power to dissolve the marriage after the death of one of the parties. The wife appealed, arguing that the death of a party that occurs before a court resolves a marital dissolution action deprives the court of authority to determine the property rights of the litigants. The court of appeals concluded that the wife is “judicially estopped” from the asserting the family court lacked the authority to enter judgment based on the June 1 stipulation. The court reasoned that under California case law, a party may not gain an advantage by taking one position and then seek a second advantage by taking an incompatible position. Here, the court pointed out that the family court had jurisdiction over the parties and the dispute at the beginning of the case. The wife’s attorney presented the couple’s agreement to the court with knowledge of her husband’s death. Her choice to submit the agreement for the court’s approval, and her agreement to the entry of the order (through counsel), estopped her from challenging the validity of the judgment she pursued. While this is an unpublished decision, and parties may not rely on or cite to it in future cases, the court’s reliance on the established case law could serve to inform later family court matters. As this case illustrates, a party’s familiarity with the local laws applicable to his or her family law case can make a significant difference in the outcome of the proceedings. 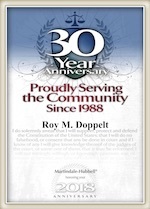 Roy M. Doppelt is a knowledgable divorce lawyer who has been representing parties in family law matters for more than 20 years. Doppelt and Forney, APLC serves clients throughout Southern California, including San Diego, Encinitas, La Jolla, and Chula Vista. For a free consultation, contact Doppelt and Forney, APLC through our website, or give us a call toll-free at (800) ROY IS IT (769-4748).